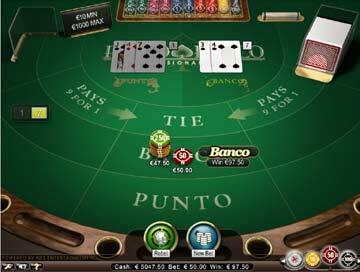 No game has attracted the attention of gambling strategists like Baccarat (aka Punto Banco). For centuries, gamblers have tried to come up with that one unbeatable strategy that would make them rich. Even today, you could spend hundreds or even thousands on a supposedly 'infallible' system. 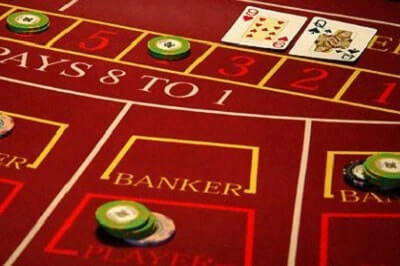 Below, we describe our recommended Baccarat strategy. 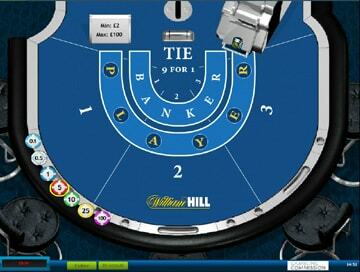 Check it out, then try it out by playing on our FREE Baccarat game (see below). 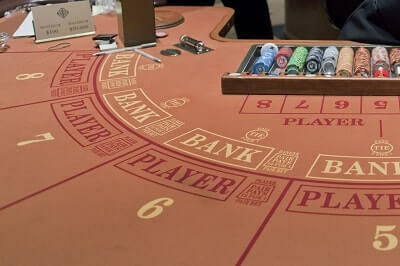 A quick look at the odds in Baccarat will show where the house has its edge - in the 'Tie' bet. This bet will win less frequently, so the pay out is correspondingly large, with the aim of tempting the player. The odds of 'Tie' winning are 10.5-1, though the payout is only 8 to 1. The two other bets (Banker and Player) have similar odds to each other, but the payouts are different as the banker bet is subject to a 5% commission (the 'vigorish'). Ladbrokes Casino are offering 3 £500 Baccarat bonuses, giving you £1,500 to play on a great range of Baccarat games, with just 100x wagering required! Finding a winning Baccarat strategy comes from understanding the rule that if you do not bet on a Tie, and the hands tie, your bet is returned to you. 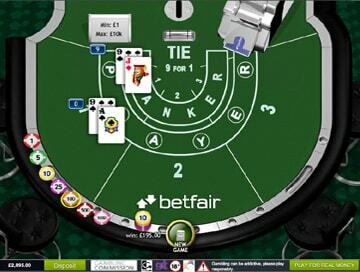 Because of this, in any calculation of Baccarat house edge, the Tie bet can be effectively disregarded. If there was no vigorish (commission), the probability of winning on Banker would be over 1 in 2 i.e. better than a coin toss. Even allowing for the vigorish, the house edge on the Banker bet is just over 1%. The Player bet has a slightly higher house edge, usually around 1.25%. But there is no vigorish, so nothing is deducted from your winnings. 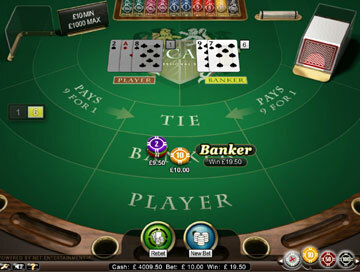 Even so, with such a low house edge, the Banker bet is still the safest Baccarat bet. Some Baccarat players find that betting on the Banker seems somehow unnatural, as though they're betting against themselves. This probably comes from playing Blackjack, where the player is always trying to beat the Banker. Remember, in Baccarat and Punto Banco, the winner is the one who bets on the winning hand, not the one who plays it. The almost evens nature of the Banker bet allows us to use an evens chance gambling system. Our preference is to use the 1-3-2-4 system, which is a way of limiting your losses whilst allowing for bigger wins. Bet 1 is 1 unit, Bet 2 is 3 units, Bet 3 is 2 units and Bet 4 is 4 units. Whenever you lose, you revert back to Bet 1. If the second loses, your loss is 2.05 units. If the third loses, you make a profit of 1.8 units (with the vigorish). If the fourth loses, you make a profit of 1.7 units. If the fourth wins, your overall profit is 9.5 units. You can find many Baccarat strategy sites on the internet recommending the 1-3-2-6 system. We've even found it for sale under the guise of an 'unbeatable' Baccarat system. Just to explain, the 1-3-2-6 is a great evens-chance system for games like Roulette or Sic Bo. But in Baccarat, it doesn't work because of the vigorish on the banker bet. Sites pushing the 1-3-2-6 will claim that a losing fourth bet leaves you even. It doesn't. A losing fourth bet actually results in a loss of 0.3 units. The 1-3-2-6 as described by those sites can only used on the Player bet, where there is no vigorish, but the Player bet has a higher house edge, so you're less likely to win! Our advice? Stick to the 1-3-2-4 - it's a system we've devised especially for Baccarat! 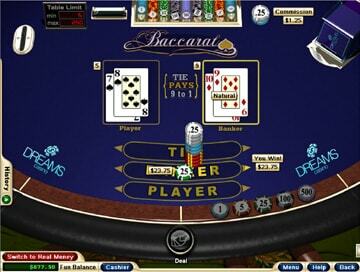 Baccarat is one of the simplest card games, with a limited set of rules and betting choices. But many players are intimidated by Baccarat / Punto Banco because in real casinos it's played in separate rooms that cater to high rollers. This gives the game an aura of 'class' which makes it seem out of reach to ordinary players. Online, there's no separation, so everyone can enjoy this fantastic game. 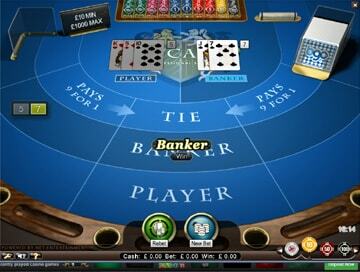 Basic rules and tips for playing Baccarat. 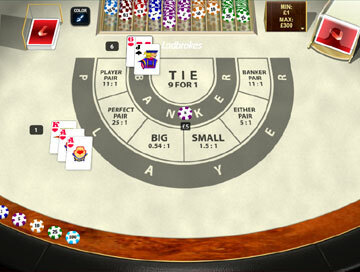 An explanation of the board layout, and the three main betting options - Player, Banker and Tie. 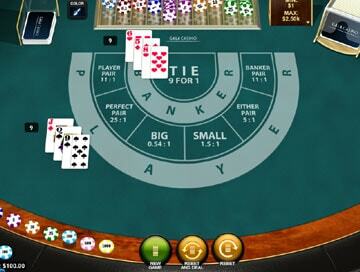 We also explain the third card rule - how and when each hand is dealt an extra card. For a game so steeped in an aura of glamour and mystery, the odds against you in Baccarat are really simple to understand. Unlike Roulette, Blackjack, Sic Bo etc, there are only three bets and three results - so only three probabilities, three payouts and therefore three house edges for you to be concerned with. Now that you're familiar with our recommended Baccarat strategy, why not put it through its paces on our FREE Baccarat game, courtesy of Bovada casino, which you can play without registering or downloading. You'll get 1000 play money credits and as long as you want to practice the 1-3-2-4 - or maybe devise a strategy of your own! Once you've familiarised yourself with the rules of Baccarat on the free play Practice game, why not try playing with real Live Dealers? It's the most authentic casino experience you can get, without leaving your home! At our Live Casinos, you can play an incredible 180 games an hour of Baccarat!